Soon after joining the Kingsford group I began talking with Guillaume Marçais about his work on minimizer schemes. This year I contributed to the most recent publication in this line of work which describes the asymptotic bounds for the densities of these schemes. This work was accepted for presentation at ISMB 2018 in Chicago, IL. A preprint of the manuscript is on bioRxiv (see Publications). 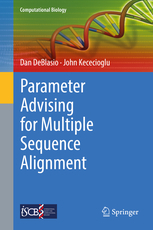 The book based on my dissertation written along with my PhD advisor John Kececioglu is now available! The work is a part of Springer’s Computational Biology series. The book contains a chapter that had not been previously published and updated results not previously in my dissertation.